One surprise that hit us when we moved to the Bay Area was how Americanised a lot of the Asian food was. After moving to NYC we found a heavenly array of very authentic and reasonably priced Asian foods. 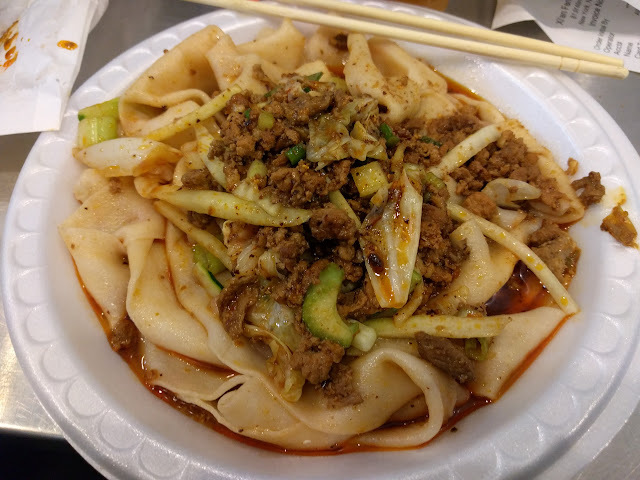 Xi'an Famous Foods offers one of the things I missed most about home - reasonably priced hand pulled noodles. Xi'an Famous Foods has several restaurants in Manhattan and Brooklyn but I tend to favour their restaurant in the East Village since it's close to a number of businesses I frequent and around the corner from a delightful Italian cake shop (more on that later). The food is decidedly cheap and cheerful but delicious spicy Western Chinese food. The noodles are all made on site and if you're lucky you can catch glimpses of the cooks making them. Being Manhattan the restaurant is reasonably small and New Yorkers have no patience for those who lose them a New York Minute. Be prepared to order if you step in line, don't take a seat until you get your food, clean up your own station and be prepared to get up as soon as you've finished. Those who do not follow the unwritten rules will get passive aggressive interruptions by people waiting to eat. Chewy delicious hand ripped noodles are stir fried in a numbing chili spicy oil that is not for the feint hearted. Try the mild first before attempting hotter! The noodles are served with vegetables and fatty meat. Both the lamb noodles and the lamb burger contain a cumin drenched dry lamb with vegetables. The burger is on a mantou style bun grilled on a flat top until crispy. The noodles are stir fried with more of the cumin, vegetables and chili oil. The Mount Qi pork is cubes of pork belly grilled with noodles and a slightly less spicy sauce. The Zha Jiang noodles feature ground pork fried in an umame soy bean sauce, deeelicious! The spicy and sour lamb dumplings are stuffed with a ground lamb filling and served with vinegar and soy. This is easily my favourite dish on their menu and reminds me of a dry tantanmen without the sesame. Go in expecting exactly what it is - a cheap limited menu of food made extraordinarily well. Not pictured are the noodle soup versions of each dish. Everything they make is excellent. Make sure to eat in, the delicate nature of the noodles does not survive delivery or a walk home. Cold drinks are available like Chinese teas and Coke products. I really rather wished they offered condiments,, I keep wanting black vinegar to cut through the oil. Also the chopsticks they use leave a lot to be desired and if you're willing to endure the odd looks of your fellow diners I would recommend bringing some of your own from another restaurant or home. 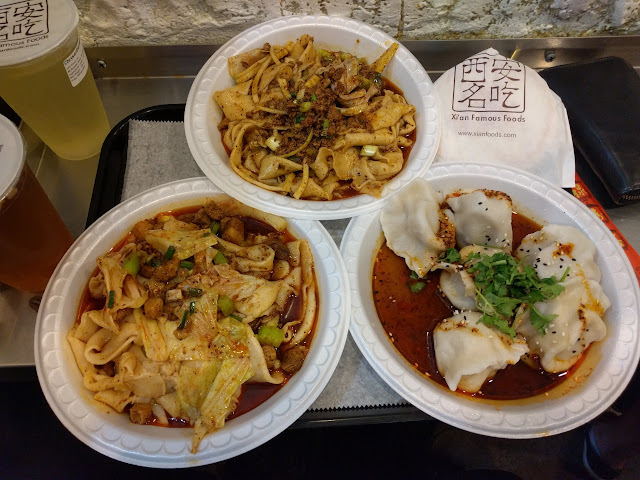 Still this is one of my favourite cheap food desinations in NYC, try it out. 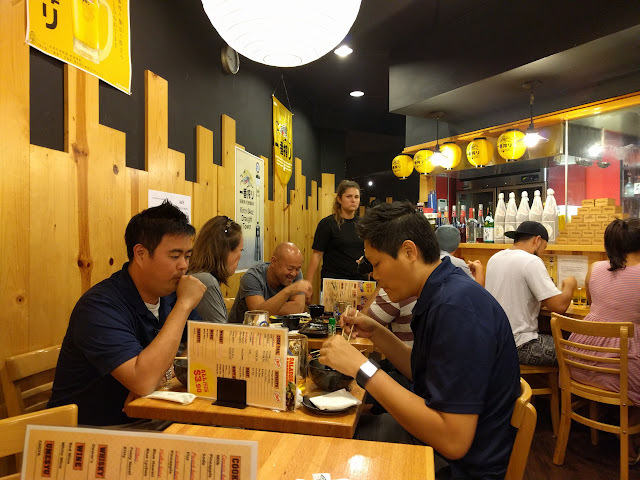 If you've spent any serious time in Osaka you're bound to have ventured into a Torikizoku "Restaurant 280" a yakitori specialty restaurant where everything from the beer to the bar snacks are a flat rate 280Y. Their cheap and cheerful booze laden atmosphere house some of my favourite travel memories so when we found a clone in Hawaii we just had to go. Exchange rates and inflation have had their way but at $3.90USD for all items it's still a total bargain. Other than the price it's almost identical to Torikizoku even down to the decor. The menu is point and slur simple, perfect for too many beers. Various bits of chicken are skewered, grilled and topped with sticky BBQ sauces. Choose chicken skewers with salt shio, BBQ marinade tare or specialty kushi-yaki like wasabi beef, tongue or pork belly. Imported Sapporo and Kirin were available off the keg plus a number of other domestic beer options. Chuhai are alcoholic high balls common in bars in Japan. 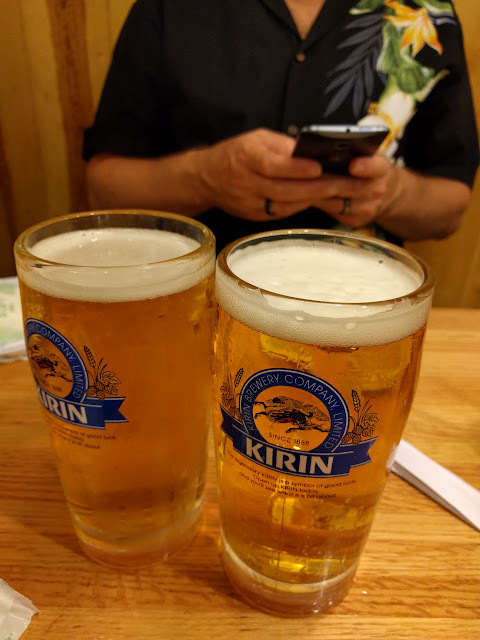 Usually sweet and reasonably low alcohol they're a sometimes safe bet when drinking rounds with salarymen if you wish to survive Japan's bar culture. Fizzy water, flavouring and shochu (white grain alcohol) are mixed and served long over ice. Add Calpis fermented yoghurt cordial for a creamy delicious option. Ground chicken meatballs are threaded on a skewer grilled then topped with okonomi sauce, mayonnaise, shaved katsuoboshi and scallions. Grilled chicken thigh with BBQ marinade and mayonnaise. Grilled beef skewer with scallions - delicious with beer! Slices of lotus root stuffed with ground chicken meat grilled to perfection. I love lotus root in everything, it's a very fancy looking root vegetable with a neutral taste that adds fiber and depth to many dishes. Fantastic with the super hot Japanese mustard provided. One of my favourite dishes particularly in warm weather. Cold silken tofu topped with ginger, soy sauce, katsuoboshi and scallions. All that meat and booze deserves a little greenery to finish it off. Fresh salad topped with a classic Japanese onion dressing. The Japanese like to end a meal with white rice and I think it's a great way to cleanse the palette. White rice is formed into triangular rice balls, brushed with a little soy and then grilled until crispy. Neutral and chewy! 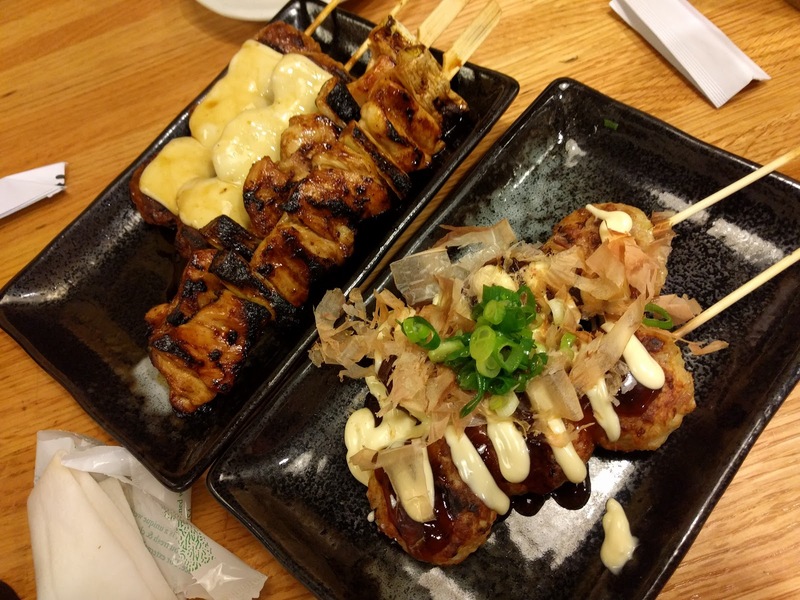 Yakitori Glad is a great example of the skewers and too many drinks Osaka style eating. Great for groups and parties, you can order a little or a lot and have a great time. Service is fast casual bar style, don't expect a lot of niceties and if you're looking for sushi or large plates you came to the wrong place. If you, like I love a rowdy night out and a lot of small plates this is an excellent time for everyone.